It’s a fast-moving game this performance car caper, if you’ll pardon the pun. Not too long ago, a model offering 150kW and 265Nm – outputs very similar to the VW Mk VI GTI, let’s not forget – for around $30K would have found itself at the pointy end of any bang-for-your-buck equation. These days, however, there is a plethora of machinery available that offers a hitherto unprecedented level of performance for your dollar. As such, cars like the Hyundai Veloster Turbo find that no sooner have they established a presence in the market that suddenly the goalposts have shifted. Hyundai’s quirky coupe/hatch has received a few choice tweaks in order to keep pace in the fiercely competitive warm-hatch segment. The range is now split into two, Hyundai pulling out some kit to drop the entry price just below $30,000, with the six-speed manual SR Turbo now $29,990. Our test car is at the other end of the scale; a fully-loaded Turbo SR+ fitted with Hyundai’s new seven-speed dual-clutch ’box (a $2500 option). 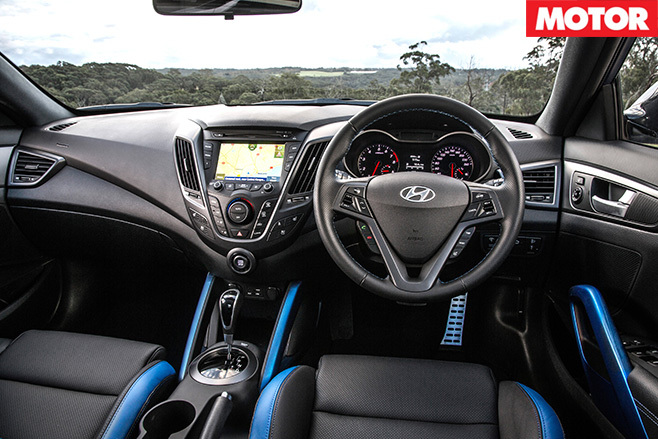 For an extra $4K over the base SR the ‘+’ adds sat-nav, a full-length glass roof, climate control, ventilated and heated seats and Hyundai’s gimmicky ‘Flex Steer’ system. Once the novelty has worn off, we’d wager that two of the system’s three settings (ultra-light Comfort and ultra-heavy Sport) will go unused by most owners. The 1.6-litre turbo four pulls strongly from low revs, though the noise it makes in the process is merely that, a noise, and not a particularly refined one. Regarding the new gearbox, Hyundai has done a great job of making a dual-clutch feel like a torque converter auto, which is both good (take-off is relatively smooth) and bad (downshifts take some time). An extra 10mm of tyre width (now 225/40 all ’round) has increased the Turbo’s grip levels, but then outright speed has never been its problem. Instead, its one-dimensional handling meant driving it hard was simply a question of how much understeer do you want to deal with, with the rear resolutely refusing to budge. For Veloster Series II, Hyundai’s local chassis development team has got stuck in, with changes to the dampers, springs and anti-roll bars aimed at involving the rear during on-the-limit cornering. And it’s worked, to a point. All four tyres feel like they are being worked harder, and in the right corner you can feel the rear shift slightly, though it requires provocation to do so. Still, it’s a step in the right direction, if nothing like as playful as something like Ford’s Focus ST. The trouble is, the Veloster Turbo is a good car in a segment full of excellent ones, and if we’re honest we’d choose a Kia ProCeed GT to fulfil our warm hatch needs. 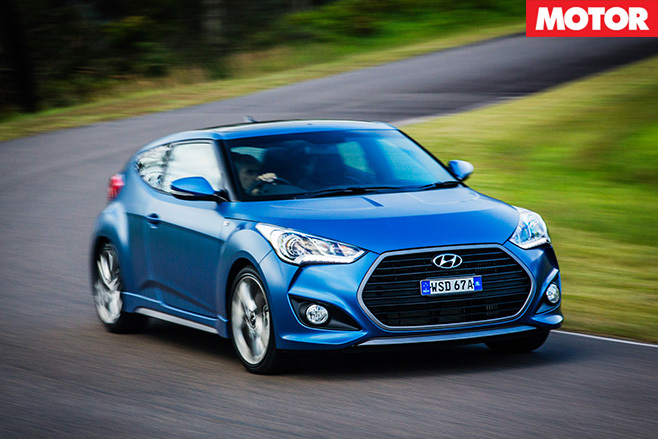 What Hyundai really needs to do is let the Veloster Turbo off its leash and inject some extra aggression to make it stand out from the pack – watch this space.